« That Time Of The Year….Good Days and Tough Days! Weather has been beautiful. Sunny days, no rain and temperatures in the low 80s. Looks like more in store for us all the way into next weekend. As I said, lots of wading water. Generation has been off the past few mornings. It is off today except for one hour this afternoon. Good news, bad news. Fishing has been good….good news! Dissolved oxygen levels are very low….bad news! With this in mind, we are reminding everyone to take try and get your fish in a little more quickly and get them back into the water as soon as you can. We are seeing lots of dead fish laying on the bottom of the river. If you have to take a picture, keep the fish in the water until you are absolutely ready to pick up the fish, snap the picture and put it back into the water. Also, make certain the fish doesn’t swim off 10 feet or so and roll over. They are fighting hard when hooked…normal response, but are beat up after this battle. Let’s take some extra time right now and help our fishery get through this annual, low oxygen event!!! James on the river a week ago this past Thursday with John from Oklahoma. Good day for John on the ruby 2 and P&P midges, and a gray scud. Gene, from Kansas, was on the river with Carolyn. He had a good day on the Ruby 2, lightning bug and the black copperhead midges. her first fish, her casting went south. Fun day for all of us. They just recently got married and I think Dolph has a fly fishing partner too. Tiger tail on a 3 ips sinking leader for Dolph and a Ruby 2, or P&P midge for Billie. Dana out last Saturday with Jeff and Matt. These guys had a good day on the red thread pattern, the ruby 2 and a ruby midge tied with silver head and silver wire. Sunday started out slow for Susan and Lionel who were on the water with Carolyn. But, we also observed that no one was catching fish. Don’t know if it was just that things improved as we got further into the day or we finally figured out what to throw. Anyway, it turned out to be a very good day on the Tiger Tail, mini sculpin in natural and the white mega worm. Dana was out with Phil from Kansas. They too had a tough start to the day. Caught some on an olive soft hackle. Lots of folks coming into the shop yesterday purchasing anything white. Also doing well on the gray scuds. 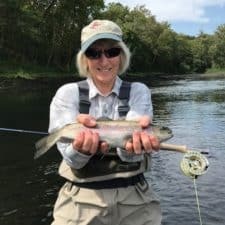 This entry was posted on Friday, September 8th, 2017 at 11:25 am	and is filed under Fishing Reports. You can follow any responses to this entry through the RSS 2.0 feed. You can leave a response, or trackback from your own site.